Discussion in 'Other Amps' started by cliffenstein, Jan 3, 2019. My DSL stays at the band's rehearsal space several hours away and I've grown tired of having no amp here at the house. I also like knowing I have a decent backup. I have been following Jet City over the past few years and have been very impressed with their overall ethos. I got the chance to pick up a gently used (very gently) 50H over the Christmas holiday season for the low price of $230. It arrived with all stock tubes (power and pre) and I'd read enough about this head to know that those all need to come out. I fired it up anyway and, though I thought the overall tone was okay, it seemed thin and small sounding. At first I was thinking I would need to send it back. I came back a few hours later and decided to see if the things people write regarding the need to completely retube it were true. I had 5 JJ 12AX7's on hand, but I didn't have any 6L6's. I did have two short bottle Tung-Sol 5881's and decided to give them a try. My word what a difference the tube changes made. I am just out of my mind floored with how good this thing sounds now. I just keep it on the Crunch channel with the Pre on 6 and I'm exactly where I want to be. I love this amp! The head is a bit smaller than a comparable Marshall head. 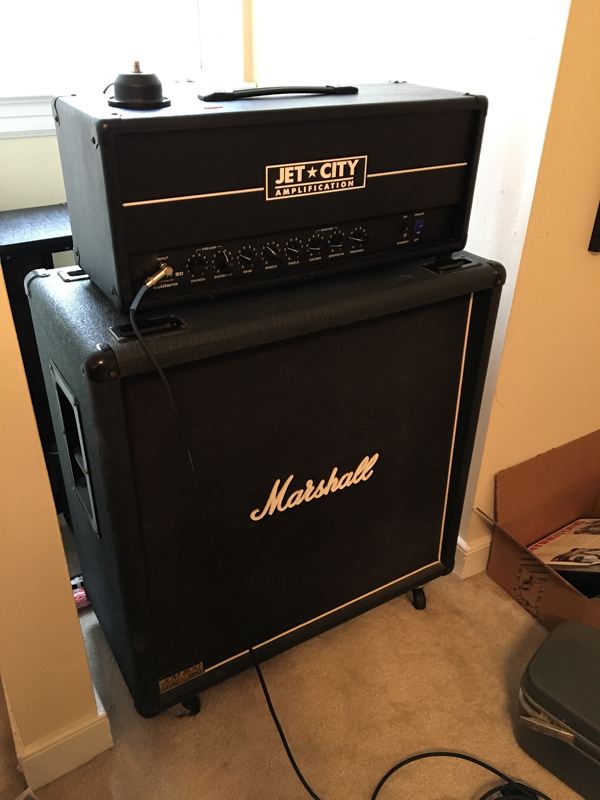 I think I may spring for a full size Hi-Watt style head box this summer to really make this thing look as killer as it sounds. Oh...and there's no inherent buzz or excessive noise with this one at all. wakjob, Durden, Trumpet Rider and 6 others like this. If that's the Cornford MK50H II clone, I have a couple of nice mods for humbucker play. 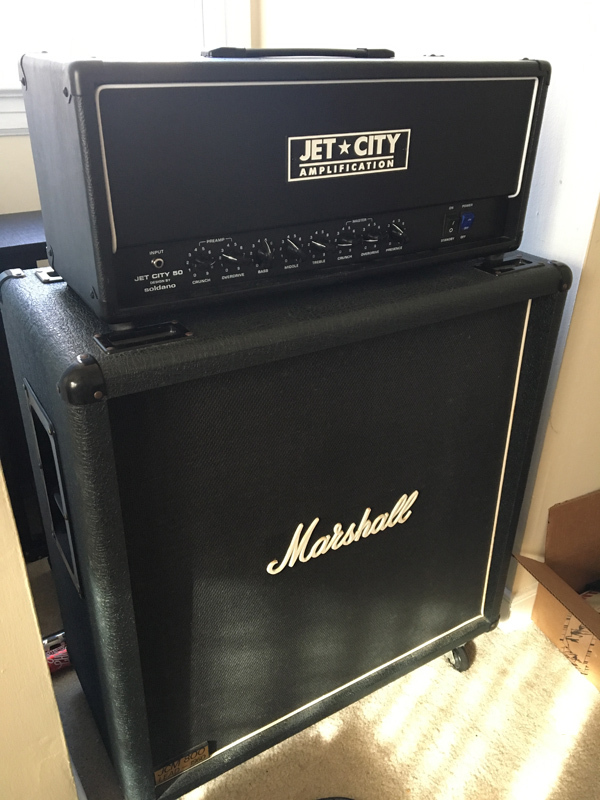 It is not...the Amelia is Jet City's amp that Martin Kidd designed. The JCA50H is the Soldano designed amp. wakjob, Len and 67Mopar like this. I almost got one of these tricked out/upgraded real cheap from the amp factory last year and wish I would have. The JCA is my favorite model in Amplitube 4. I've never played one but they sound real good on YT. Saw a guy comparing it with a Solodano and I liked the JCA better. Congrats, I have multiple JCA amps and I really like the tones. Killer bang for the buck. wakjob and cliffenstein like this. My word what a difference the tube changes made. I am just out of my mind floored with how good this thing sounds now. I just keep it on the Crunch channel with the Pre on 7 and I'm exactly where I want to be. I love this amp! jchrisf and cliffenstein like this. Here's a clip I made this morning of some mindless riffing to test out new JJ 6L6GC power tubes I had just put in. I’m getting the amp properly biased on the 19th and will post a fresh clip afterwords. wakjob, BftGibson, J Saw and 3 others like this. Those are sweet sounding amps even in stock form, and there's also some nice mods for that head that seem easy to do floating around out there if the urge strikes you. tce63 and cliffenstein like this. Thanks...I'm getting it biased Saturday...can't wait! Deep Purple fan likes this. Really the best sounding tubes in this are the wafer bottom Sovtek 5881's. Maybe next time you have to change tubes give them a try, the JJ 6L6's may give it a bit too much zing on the top end when you get them biased. Just a suggestion, enjoy!! I’ll find out tomorrow and report back. Lots of info on schematics, upgrades and mods. Bias stock was set at 17.4, plate voltage 490, bias now set at 40. Amp sounds more alive and thick and incredible. I play only on the crunch side and it’s Marshall city all the way. I like this amp as much as my properly biased 1997 DSL. Mine is a nice compliment to my Marshall DSL. The JCA50 has more of a Soldano tone - crunchier with a lower mid peak. Less forgiving than a Marshall, but still a greate tone. Mitchell Pearrow and cliffenstein like this. I don’t use the Overdrive channel...I find it to be way too gainy. The crunch channel is giving me all I need. I’m not hearing an overwhelmingly different tone than what I go for on my DSL or on my bandmate’s 1981 built 2204 for that matter. I’ve read that channel 1 is a JCM800 tone. Definitely sounds like it to me. I don’t really hear a midrange difference or anything...just sounds exactly like what I like. I am soooo glad I bought it! Doug at JC sent me a new front baffle (same as comes with the 100H LTD). It arrived today and I promptly put it on.